Many Americans would be surprised to learn that Abraham Lincoln’s birthday, February 12, 1809, has never been celebrated as a federal holiday. The day is often associated (erroneously) with Presidents Day, officially Washington’s Birthday and celebrated on the third Monday in February. On February 12, 1866, ten months after his assassination, the first address commemorating Lincoln’s birthday was given to Congress. Historian and statesman George Bancroft wrote in his memorial remarks that Lincoln was “to be remembered through all time by his countrymen.” Seven years later, a holiday celebrating Lincoln was proposed by Julius Francis, a shopkeeper from Buffalo, New York. Francis began sending Congress elaborate memorial pamphlets as part of his campaign to establish a legal holiday for Lincoln on February 12. These memorials, signed by 50 residents of Buffalo, were placed “on parchment, backed with blue silk, with 50 white stars, and exquisite needlework border, inserted in a folding case of French walnut, and enclosed in a Russia leather case.” A year later, Francis organized the first public celebration of Lincoln’s birth in Buffalo, which was celebrated each year until Francis’s death in 1881. This event included many readings in honor of Lincoln, as well as an official address, singing, prayer, and instrumental music. Francis also incorporated the original Lincoln Birthday Association on December 24, 1877. Your club has well and wisely acted in making this the commencement of an annual observance of Mr. Lincoln’s Birthday. The day should be made national like the Birth day of Washington. Let each be appropriately observed, as one of the best things to inculcate upon those who, in the ages, shall come after us. It is patriotic to do so, and it serves to promote a love of country and keep alive and fresh a memory of Patriotic men. In 1951, a Presidents Day National Committee was formed by Harold Stonebridge Fischer. He lobbied for the creation of a day honoring all presidents to be celebrated March 4, the original inauguration date. This act was defeated in the Senate Judiciary Committee, on the grounds that the holiday would be too close to Lincoln’s and Washington’s birthdays. 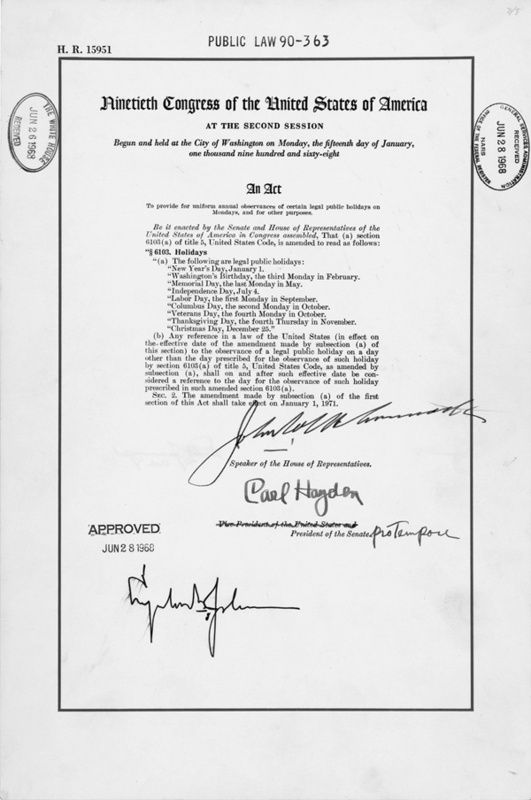 Though not federally enacted, many state governors liked the idea and proclaimed Presidents Day a holiday. Establishing Lincoln’s birthday as a federal holiday was further complicated by the passing of the 1968 Uniform Holiday Act, which moved several federal holidays, including Memorial Day and Washington’s Birthday, to specific Mondays throughout the year in order to create more three-day weekends. Eventually, individual states created their own Presidents Day holidays to be observed on the third Monday in February. This celebration has been enacted in some fashion by 38 states, though never federally, and each varies by state. While some mark the day as a specific remembrance of Washington and Lincoln (like Arizona), others view it as a day of general recognition for all U.S. presidents. Alabama celebrates Washington and Jefferson as opposed to the more common combination of Washington and Lincoln. A few states observe Washington’s Birthday in February and then celebrate Presidents Day in a different month, for example, the day after Thanksgiving in New Mexico and December 24 in Indiana and Georgia. Eighteen states don’t specify at all what Presidents Day celebrates. Presidents Day has also gained some national recognition from retailers, who use the long weekend to offer sales. A few state governments have enacted legislation recognizing Lincoln’s birthday on February 12 as its own official holiday. Most notably, Illinois, the “Land of Lincoln” and his adopted home state, celebrates Lincoln’s birthday as an official school holiday, along with a few other states including New York, Connecticut, and Missouri. However, this number has declined in recent years, when both California and New Jersey ended the celebration of Lincoln’s birthday as paid holidays to cut budgetary costs. Unfortunately, more states now celebrate Black Friday, the day after Thanksgiving, as a holiday for state employees than celebrate Lincoln’s birthday. Even without an official national holiday, Lincoln remains among the most admired American presidents. His face is printed on the five-dollar bill and stamped on the penny. He has national shrines in three states, including one of America’s most iconic landmarks—the Lincoln Memorial in Washington, DC. It is these two accomplishments that our public memory primarily revolves around and the reason that his image on the coin was received with such high approval.